The Force Foreground option lets you make intricate selections when an object lacks a clear interior. 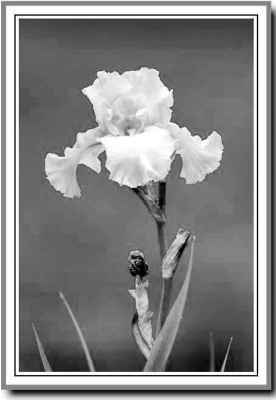 * For an illustration of extracting the weeds image, see figure 6-4 in the color section. 1 Choose File > Open, and open the file Weeds.psd image from the Lessons/Lesson06 folder on your hard drive. 2 Choose Filter > Extract. 3 Under the Extraction area of the dialog box, select the Force Foreground check box. You'll start by selecting the color on which to base your selection. The Force Foreground technique works best with objects that are monochromatic or fairly uniform in color. 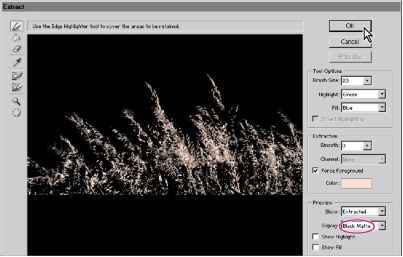 4 Select the eyedropper tool (y ) in the Extract dialog box, and then click a light area of the weeds to sample the color to be treated as the foreground. 5 Select the edge highlighter tool (.>) in the Extract dialog box. 6 For Brush Size, use the slider or enter a value to select a fairly large brush (about 20 or 30). 7 Drag to begin highlighting the wispy ends of the weeds where they overlap the dark background. 8 When you've enclosed the weed tips, drag to highlight the top third of the weeds fully. The highlight should be solid. 9 Choose Black Matte from the Display menu in the Extract dialog box. A black matte provides good contrast for a light-colored selection. For a dark selection, try the Gray or White Matte option. None previews a selection against a transparent background. 10 Click the Preview button to preview the extracted object. 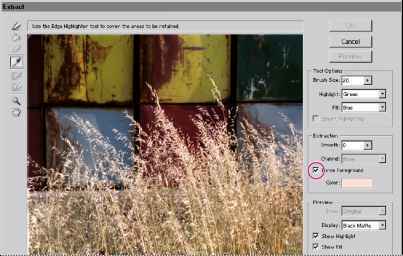 • Use the Show menu to switch between previews of the original and extracted images. • Select the Show Highlight option to display the object's extraction boundaries. 12 When you are satisfied with the selection, click OK to apply the final extraction. All pixels on the layer outside the extracted object are erased to transparency. Note: An alternate method for making intricate selections is to select areas by color. To do so, choose Select > Color Range. Then use the eyedropper tools from the Color Range dialog box to sample the colors for your selection. You can sample from your image window or from the preview window.